This podcast helps people live farm fresh without a farm® – from DIY food crafts, to preserving the harvest to growing your own food in small spaces. But what if you DO want to start a farm?? Emily Aarons and her husband Andrew wanted to do just that. They wanted to start a farm. Not a big, giant mega-farm, mind you. They wanted a small farm….in the suburbs. They wanted their farm to be part of an ordinary neighborhood. So…they did what any industrious entrepreneur couple does. They took the leap and did it! 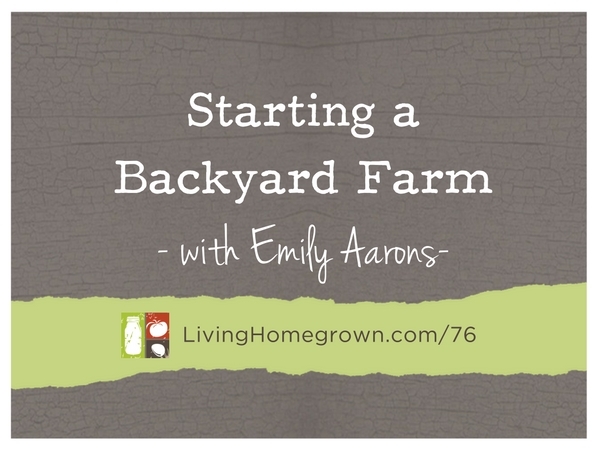 Join me in this week’s podcast as I interview Emily Aarons – certified organic chicken farmer. She sells organic eggs and produce. And where is that farm located? In the backyard of her Massachusetts suburban home. And even if you haven’t considered doing this yourself, you may be curious what it takes to start a certified organic farm in your backyard. A little gumption and big desire to make a difference in the world of sustainable food. Emily and Andrew have both…in droves. 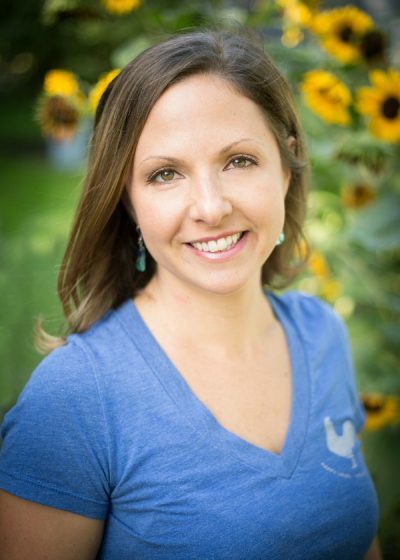 Emily is a multi-passionate “mom-preneur” who blends her passion of sustainable food with holistic wellness practices. She has a private practice as a massage therapist and wellness coach. But she is also an organic chicken farmer and local foodie. She loves to connect with the community to teach people about backyard chickens and living a more sustainable lifestyle. She and her husband Andrew started an organic farm in their suburban home on just a small portion of their 3 acre property. They have over 90 chickens, 12 ducks and they sell organic produce at their local farm stand. This was great! First of all the Cranberry Recipe. I got my first laugh of the day when I read cranberries “are tart little suckers”. Thanks. That recipe sounds great too, by the way. Then I saw “Wicked Cool Chicken School” and nearly fell off my chair laughing that is so Boston/New England sounding and serious while funny. Thanks again. This is also something I am interested in since I don’t know if my dream of having 20- 60 acres in the country will ever materialize. Keep up the great work Theresa. I definitely appreciate you and the effort you put into this. Secondly, I have for the longest time wanted to produce/make as much of everything I can for my family. I love the idea of knowing what we are eating and using, as well as the added benefit of trying to lower our monetary output (with 4 soon to be 5 boys it doesn’t make for a very financially lucrative life). It can also be a daunting task when you can’t even keep a house plant alive or have ample resources available in your area to learn from, but I am determined. I am actively trying to learn your canning/preserving practices for my first and subsequent harvests and compiling my own plant profile for each plant I want to grow. One thing I have been having the hardest time trying to narrow down is what I can grow at home (I have an acre plot) to feed chickens. I’m wanting to lower exponentially or eliminate completely the cost of feed. Do you know of what combination of plants can be grown to feed chickens to eliminate the need to buy feed? Or do you know of a reputable learning source? I’ve been trying to gather the information on my own but what I find is either inconsistent or unclear. I would like to take a class (though I can’t afford to) and I’ve bought books but none seem to have resources for growing your own food except supplementary. Any way, If you know the answer or of any resources your help would be greatly appreciated. I reduce the cost of my feed by letting my chickens forage some of my compost, garden cuttings and weeds. But I know Justin Rhodes has a whole system for reducing feed costs. Here’s an article he wrote on that. I hope it helps!